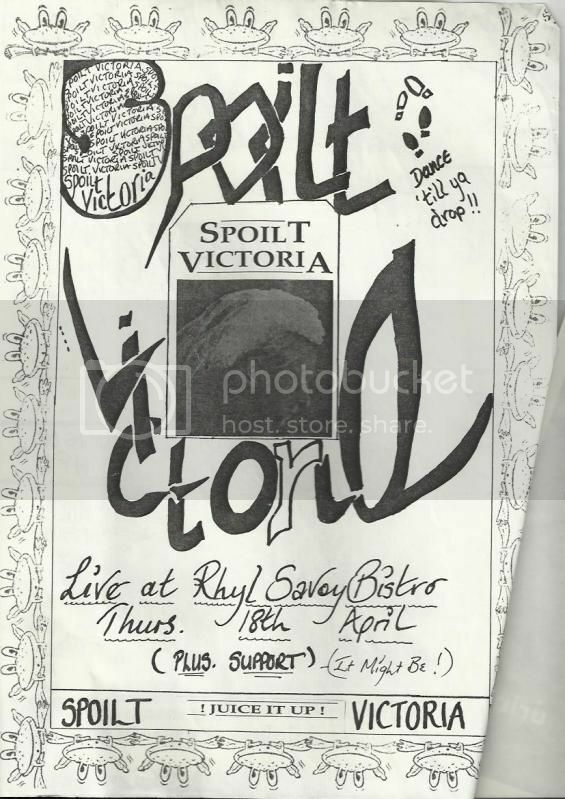 I DJ’d and did the lights for this gig – got it on tape somewhere… Support band featured Alun Tan Lan (now of Y Niwl then known as Alun Evansh) and I’m not sure if they were actually Boff Frank Bough and simply taking the piss. The name on the poster is It Might Be, which the title of a Spoilt Victoria song. Regardless of their name It Might be Boff played a feedback fuelled Jesus & Mary Chain style set. Spoilt Victoria were the juiciest band in pop without a doubt, it was fun, funky and punchy – I have their demo (twice) and also saw them in Tal-y-Cafn playing at The Ferry – they morphed into Mr Grimsdale, who I’m pretty sure got played on daytime Radio One when Steve Wright in The Afternoon tried to get down with da kidz and play a demo every Friday.